As you review this website, chances are that you or someone you care about has scoliosis. You are not alone. Scoliosis is estimated to affect at least 4.5% of the population. In dealing with thousands of these cases, we can only imagine the helplessness and confusion that go along with getting this diagnosis. We understand, just like you do, that scoliosis can impact your life with not only progressively increasing pain and visual physical changes, but with many other health concerns that will affect the quality of your life and your longevity. Whether you have been living with scoliosis for years or decades, or whether your scoliosis has only been detected recently, you are now looking for answers as to why this has happened, and what your treatment options are. If you have researched the available alternatives, you also understand that, unfortunately, the mainstream options are either painfully invasive, lacking in results, or both. You are probably wondering if your only viable choice is to be a victim to what scoliosis will continue to do to your body, day in and day out, if you must continue to live with the pain and often the disfigurement that often relentlessly progresses. We want you to know that there is hope. Dr. Sid is trained extensively in helping people with scoliosis not just to reduce your pain, but also to physically reduce the size of the spinal curvature so that your body can begin to work properly. When you reduce the abnormal curves in your spine, you will not only feel great, but your body will function better, and the well-documented organ dysfunctions that are associated with scoliosis can be improved or even prevented. We want you to understand the methods used during treatment, so you can feel confident when choosing to seek treatment with Dr. Sid. 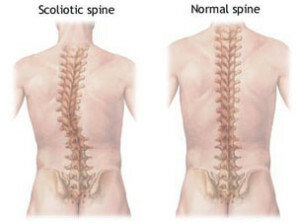 Understanding what the first visit will be like, what our unique method for dealing with your scoliosis entails and what our approach is to getting you to achieve maximum scoliosis reduction will help you feel more comfortable with making the right decision for you or your child’s health care. We’ve seen some amazing results and testimonials from people that have had their lives changed by the method of scoliosis reduction. However, the most important transformation will be yours. Helping people with scoliosis is our mission, goal, and purpose. We hope this will not only inform you what the our method has to offer, but that it will inspire you to take control of your health and change your life forever. try to hold it together by fusing its structure. Chiropractors, however, view the spine as an engine. If the engine in your car starts to run funny, and you fuse the cylinders together, this might not solve the problem. Motion is essential for proper functioning of the spine and the associated soft tissue components. The reason your spine buckles as the curve in your neck disappears has to do with physics. When you carry your groceries in to your house from your car, you carry the bags close to your body. Increasing the distance between your body and the bags of groceries causes an increase in the apparent weight of your burden. In the same way, holding your head forward puts a greater stress upon your spine. In fact, for every inch the head moves forward from your center of gravity, the apparent weight of your head increases by 10 pounds! One of the easiest ways for the body to adapt to this increased load is to add another curve into the spine. If you are holding a heavy weight in your hand and flex your wrist forward, your elbow will swing out to the side to make it easier for your muscles to support the weight. With our alternative scoliosis treatment, you can correct the scoliosis without bracing! 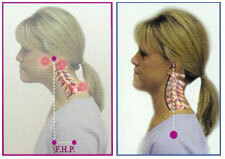 There are different reasons why the curve in the neck disappears. Sometimes it is a motor vehicle crash, or an incident of trauma. More often, however, it may develop slowly, over time, as we live day-to-day. Studying in school, working at a computer, or focusing on a project on our workbench often requires that we hold our head downwards and forwards for long periods of time. Eventually, this causes the spine to slip, bit by bit, until the muscles become tight and strong. The body then begins to use these stronger muscles more than the weaker ones, reinforcing the change in posture. With the loss of the curve in your neck, the nerves that travel from the brain to every single cell in our body begin to suffer. When taking a precision x-ray – that is, one not to rule out fractures or abnormalities, but rather to measure the position of the spinal units – positioning matters more than one might think. Even a slight rotation off from center will skew the results and show an inaccurate image. For this reason, we must be very concerned about how the x-rays were taken. They must allow an objective outcome assessment. X-rays from other sources oftentimes can be unreliable if they are shot at different angles or focal distances, which prevent comparison between films.